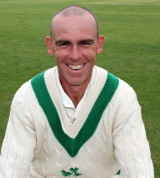 A strapping fast bowler born in Australia, Johnston’s career began at New South Wales where he played alongside the likes of Mark Taylor, Michael Slater and Brett Lee, before choosing to represent Ireland. A positive captain who led from the front, he had little problem motivating his side – as demonstrated when Ireland bounced back from a disappointing World Cricket League in Kenya, where they finished 5th, to demolish the United Arab Emirates and qualify for the final of the Intercontinental Cup. He tore the heart out of the UAE batting line up in their second innings taking three for eight from his eight overs as Ireland recorded a morale-boosting victory by an innings and 170 runs. He led Ireland to a thrilling tie against Zimbabwe in their first match of the 2007 World Cup before beating Pakistan – Johnston hit the winning runs – to record one of the biggest upsets in history. In March 2008, at the age of 34, Johnston announced that he was taking an indefinite break from international cricket in order to recuperate and spend some time with his family, but returned for Ireland’s Intercontinental Cup match against Canada five months later and was a vital member of the side – captained by William Porterfield – that reached its third successive Cup final. In April 2009 Johnston’s career-best figures of 5 for 14 set up Ireland’s win over Canada in the final of the ICC World Cup Qualifiers, and later that year he came within a whisker of securing the first Irish victory over England with a fine allround display as he ripped through the top order with four wickets and then hit an unbeaten 20 that couldn’t quite get Ireland home. Though time is running out for Johnston, he remains a consistent performer for Ireland and will be a vital member of their squad at the 2011 World Cup. More updates about Trent Johnston, Trent Johnston profile, Trent Johnston biography, Trent Johnston history, Trent Johnston cricket record, Trent Johnston highest score, Trent Johnston 100s, Trent Johnston 50s, Trent Johnston fastest century, Trent Johnston 50, Trent Johnston fastest 100, Trent Johnston pictures, Trent Johnston ranking, Trent Johnston batting, Trent Johnston bowling, Trent Johnston fielding, Trent Johnston average, Trent Johnston wife, Trent Johnston family, Trent Johnston children, Trent Johnston IPL, Trent Johnston CLT20, Trent Johnston T20, Trent Johnston ODI, Trent Johnston Test will be shared soon. You can also share your comments about Trent Johnston.